This is rather an expensive suit, isn’t it? This suit is shaped to my figure. A business suit usually consists of matching pants, coat, and vest. Do you like the make of this suit? He’s looking sharp in the suit he’s wearing today. His brother wears Italian suits and drives a sports car. 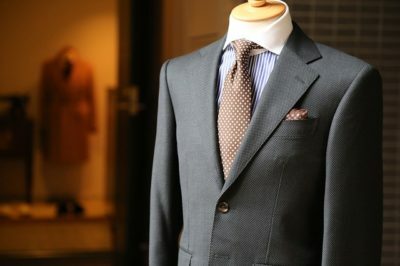 How much does it cost to have a suit made? I don’t think Jim possesses a suit. I’d like my suit dry-cleaned. More people are buying bespoke suits. No matter where he goes, he wears the same blue suit. The colors in your tie are too subtle for your suit. The tie doesn’t go with my suit.